A Lifestyle of Peace: Philosophy, Jesus Christ & Apologetics: To Carry the Gospel: Am I Called to be a Pastor? To Carry the Gospel: Am I Called to be a Pastor? The greatest mission in the world, the greatest calling in the world, and the vocation of most importance in light of eternity is none other than to pastor, by serving as a leader of God's church. I know that I'm called to this life mission. I'm wondering: Are you? God may be calling you if your reading these words. So keep reading. I'm going to tell you the story of how I encountered the call, and I'm going to tell you about the organization I was called into, called The Salvation Army. Many people don't seem to know much about the Salvation Army and what the Salvation Army does. I know for the longest time all I really knew about the army was the red kettles in front of stores, and that they did social services and gave out food to the needy. Otherwise I didn't really know, or care about what they did. But when I encountered Christ in my life, it soon became important to me, the needs of others and what I could do to help. I learned that the Salvation Army was a church movement. Given the name, I suppose that makes sense doesn't it? Eventually I felt and knew I was called to officership in the Salvation Army. An officer in the Salvation Army is similar to being a pastor in another church movement, though there are some differences. I thought I would share my testimony of how I ended up in this calling for others out there who might be questioning if they are called to pastor a church, and if so, if they are being specifically called to the Salvation Army. 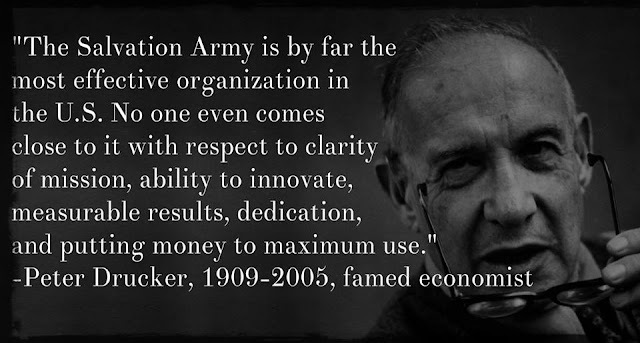 A Salvation Army pastor is called an "officer" because the Salvation Army is set up in a quasi-military fashion. Graduating cadets are commissioned as Lieutenants. In addition to pastoring a church, Salvation Army officers also help distribute social services, give out food, administrate homeless shelters and addiction treatment centers, and deliver emergency disaster services. Maybe you've never even considered the possibility of being a pastor. Or maybe you've considered pastoring, but never thought of the Salvation Army as the place to do it. Well, maybe your reading these words for a larger purpose. So this is my testimony of struggle, addiction, and victory that led me into the ranks of the army. These are my views, and only my views, and do not necessarily represent the views of any organization. This is my experience and my beliefs. I was born at Wausau hospital in 1985. I was raised by average lower middle class parents, my mom being a nurse and my dad being a teacher. My dad worked at the Salvation Army Wausau as a GED teacher in the NTC-Salvation Army Learning Center. My mom worked as an RN at Wausau hospital. I had a great deal of pain as a child due to stomach problems, to the point that I would scream as a baby every night. In fact I screamed so hard and so often in pain that to this day I have a concave chest. I had a generally happy childhood though; grew up with one sister three years younger than I. Being left handed, I had a hard time in gym learning the skills from the opposite perspective. I had a great experience in elementary school and had lots of friends. I was a natural leader and organized football games, 11 on 11 during recess. During middle school I was bullied a great deal, and sort of got lost in the larger school environment. There was a lot of bullying and I was beat up several times by other students. In addition, during this time my parents began having increasing problems. My dad during this time began to force me to be a sports and basketball star. It was his dream for me to be a football, basketball, soccer, and tennis star. I had other ideas, in fact I preferred to be in front of my computer or reading in the library. It was a nightmare for me. I would go to school, get bullied, go to basketball practice and get bullied more by the players who knew I didn’t belong there, and then I’d come home to my parents screaming at each other in the hallway. I had been raised Catholic, but I never really connected to it. I went through the CCD classes and they were terribly boring. I was never taught about Jesus or that he loved me. I was never taught that I needed to read a Bible, or have a relationship with Christ. When I was nearing the time to be confirmed, I argued with the priest about the existence of God and indicated to him that I didn’t really understand any of it. My mom was furious when I refused to be confirmed in the Catholic church. During that time I increasingly fought with my dad and he fought back twice as hard, trying every possible way to manipulate me into continuing to be the sports star. Finally the coaches told my dad that he couldn’t force me to play sports anymore. It had to be my choice. I stood up for myself and refused to play anymore. My dad wouldn’t speak to me again for another year and a half. Right around that time my parents did get divorced and my dad left the house. I began experimenting with prescription drugs, a poor decision, but I didn’t know what else to do. I was expelled from high school and woke up in a mental hospital, being told I had threatened to shoot up the school. After that I fell in with a group of guys, ironically all from divorced homes and we hung out, played videogames, and used drugs. I got into more and more trouble as the years went on. But I did start attending college and found a passion for writing and reading poetry at acoustic café nights. I did particularly well in college at the University of Wisconsin extension. I found an interest in writing and journalism and became a writer and distributor for the college newspaper. Eventually I became the assistant editor of the newspaper. Unfortunately my drug and alcohol use was increasing. I was beginning to realize I had become addicted. I worked several jobs, but nothing really seemed to click too well in my life. At age 20 I was arrested for drunk driving and possession of marijuana. I was put on probation, and then later revoked for getting in trouble again. I ended up in jail several times. I got another DUI when I was 22. I went to treatment and actually managed to stay clean and sober for quite a while. But eventually addiction took over, I needed something more than just recovery. I didn’t know then, but I needed Jesus. I got into more and more trouble, and my condition continued to worsen over time. I was starting to overdose and end up in hospitals. I went to several rehabs, detoxes and treatments but nothing seemed to be working. In 2011 and 2012 I started carrying a Bible given to me by my grandpa. I didn’t know it then, but my grandpa and my mom had both gotten saved at a Baptist church in town. They were going to a Bible study and the people there were praying for me. God was sovereignly orchestrating events in my life. There were several factors that were pivotal in my conversion to the Christian faith. Two of the great pillars were praying grandmothers. My grandma Monica and my grandma Patricia both prayed for me constantly. In addition were the prayers of my mom, my grandpa Bernie and the prayers of the Bible study group at Mosinee Baptist Church. In addition, in 2010 and 2011, my grandpa Bernie met with me several times, gave me a Bible, and told me about Jesus. I thought it was really stupid at the time and even felt embarrassed for him. I thought of him: what a fool! It turns out, I was the fool. So though I continued to use drugs and drink, I began carrying a Bible around with me wherever I went. And I read from it as I wandered about the town, a pariah and shunned vagabond. That Christmas I asked for Bible stuff, and my cousin bought me a copy of the DVD movie called “The Gospel of John.” The movie is in fact word for word the gospel of John (Good News Translation.) I think more so than anything else, watching this movie over and over helped me to understand who Jesus Christ was and why he came. I became obsessed with the movie watching it over and over. I continued to read from the Bible. But it was like I was swimming around the outside of the truth, observing it, but I needed to access it and come within it and allow it to transform me. Thankfully God the Father was sovereignly drawing me to his son Jesus Christ. One night, which I mark off on my calendar as November 1st 2012, though I don’t recall the exact date, I was sick and tired of being sick and tired every day. I just couldn’t do it anymore. I needed something different. I needed help. Words cannot truly express the desperation of the moment, I had lost everything in life. But something so wonderful came into my mind, a simple suggestion from the beyond: Call out to Jesus Christ. So I crawled onto the floor, a bloated mammoth, a beast, a loser, a creep, and I fell onto my knees. At that moment I cried out to Jesus Christ, a literal guttural cry from within and without, believing that this ancient savior Jesus Christ could really help me. I threw all my hope onto Him, I cried out in desperation from the depths of my soul. And at that moment I felt the ground shake around me and I fell down onto my face and covered myself in fear not knowing what was happening. But I’m certain now that it was the presence of God coming upon me and the celebration of heaven itself as a wretched sinner fled to Christ. Essentially what Jesus Christ did for me, was he cleansed me of all my past sins and took the penalty for them all upon himself. That is the reason he died on the cross, to pay the penalty for all my sins. In addition, he set me free from active addiction and alcoholism and so many other dark lifestyles. In addition, he gave me new birth, in that I became a new person, or more so, I became more truly myself, as a child of God. The person I used to be, when I think back, seems like someone else, a stranger, not really me. From that day on everything in my life began to change. I started to pray in the morning and at night, kneeling before God and thanking him for changing my soul. I studied the scriptures constantly. God led me into a church called New Day Christian Church. I was fed well at that church and I was baptized 5 months later. At that time I made a public profession of my faith and shared my story to the congregation. I began attending a small group at that church. I began attending recovery groups. I worked the twelve steps with a sponsor and cleared out the wreckage from my past, making amends to those I harmed, and learned to practice my Christian faith through devotions and prayer and service to others. I knew almost instantly that I was called to full time ministry. I took some classes on the basics of Christianity from Christian Leaders Institute. This led to me applying to Liberty University the largest Christian college in the world to study religion. I began leading several ministries at New Day church, including creative team, planning team, and prayer team. I also began leading a Bible study. About a year and a half later I began working at the Salvation Army of Wausau transitional living center. Since I worked weekends I started attending the Salvation Army chapel. I quickly found passion for the work in the Salvation Army, and the rest is history. I didn’t expect or intend to serve as an officer in the Salvation Army. I knew I was called to minister, everything was lining up in my life to make that abundantly clear. After being saved in the Baptist evangelical church, a part of Converge Great Lakes, I started seeking entry to that same movement. But it seemed that every time I walked up to a door of ministry, it wouldn’t open for me. I got involved with a Converge church plant, but once again things didn’t work out. Fate would have it that I began working at the Salvation Army transitional living center in Wausau, Wi. Under Ed Wilson our social services director we turned the TLC into a sort of treatment center style shelter. Word got around Wisconsin that this was the place to come if you wanted to turn your life around. I gave away bibles, handed out tracks, talked to people about Jesus and shared the gospel regularly. I led an alcohol and drug addiction recovery group. I did caseworking with clients assigned to me. I was impressed by Ed Wilson, a former officer, and I was impressed by the mission of the Salvation Army. At the shelter I worked rotating shifts, which included Sundays. I started attending the Salvation Army church. I made it my mission to try and build up the church, which had dwindled to only about 5 to 10 attenders. I started attending corps activities, and eventually Ed Wilson’s wife Dee shared with me about officership. I honestly hadn’t even considered it, even after attending the corps for quite some time. She told me about officership. She said I would be ideal for it and suggested I learn more about it. I began to think about. I began to pray about it. I later indicated to Lt. Jacob and Melinda Tripp my interest. 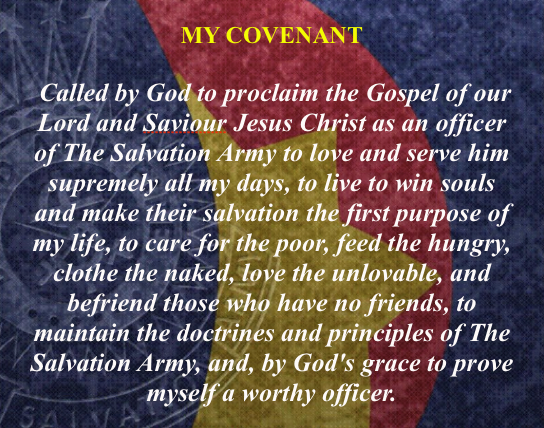 I also wrote a message asking some questions about officership to the Salvation Army WUM candidate website. I met with Captain Shannon Thies about officership, and I began attending Salvation Army conferences. If I were to recommend one single thing to do if someone is considering officership, it would be attending Salvation Army conferences. I’m not sure why, but it made a huge difference. At this point I was still very much uncertain about officership. But I was certainly willing to consider the possibility. I attended three conferences, I believe it was regeneration, youth councils and a 730 candidate conference. I’m not 100% certain. But at each of these conferences there were times of moving toward “officership.” People were encouraged to get out of their seats if they were feeling the call of God, to move toward officership. All three times I found myself getting out of my seat and moving toward officership. I became a soldier of the Salvation Army. It fit perfectly with my life goal of remaining clean and sober from drugs, alcohol, cigarettes, gambling, and other sinful behaviors. I led a young adult bible study which had healthy attendance of 6-12 people regularly. We built the Wausau church up from 5-10 to 25-35. I was accepted into the ministry discovery program internship through central territory. I believe it was shortly after that last confirmation that I finally stopped doubting the call to officership. The truth is though, I’ve had a hard time with the call. Why? Because it’s not what I would’ve chosen. I wanted to be an itinerant evangelist, or a Christian apologist sharing the gospel on college campuses. Or I had considered simply pastoring a small church, sort of part time, and spending a lot of time writing on the side. I didn’t want something that would be 40+ hours a week minimum. But it isn’t about what I want. It’s about God’s will and what He would have me do. One of my heroes Ravi Zacharias has traveled the globe as an itinerant preacher. And when he speaks he shares the fact that he can’t stand to travel. Yet God called him to this ministry. Another hero of mine, Canon Andrew White was raised by protestant parents, yet God indicated to him, in a moment when he paused and ask, “What next Lord?” that he was being called into ministry in the Anglican church. He immediately protested, but he obeyed the call and God blessed him with his incredible ministry today as the “Vicar of Baghdad.” So despite my sincere concerns regarding officership, I’ve chosen to obey the call of the Lord, trusting that He will make me able to fulfill it. I don’t question the call anymore. I need to place total faith in it. God has confirmed it time and again. I’ve read that a calling can be confirmed based on three criteria: support of family/friends, doors opening, and personal conviction. My family firmly supports my calling into the Salvation Army. My friends are happy for me and support me in it. In addition, my dad has worked at the GED program at the Salvation Army of Wausau for 23 years now. It made it seem like a family heritage connection as well. My grandfather, the one who gave me my first Bible, said that he always respected the Salvation Army officers he worked with when he was chief of police. Second, doors opening. Every time I’ve walked up to a door in the Salvation Army, it’s opened for me. That hasn’t been true anywhere else. This was a major contributing factor to the call. 3rd personal conviction, meaning do I believe I’m called to this work, and as previously stated, I certainly do. Does the work give me peace? Yes it does. So in conclusion, through God’s guidance I’m certain I’m called to full time ministry in the Salvation Army as an officer. I love to share the gospel, I'm a creative evangelist at heart. I like to use imaginative ways to get the gospel out there. I’ve shared the gospel many times and in many ways throughout my short time as a Christian. One of my favorite ways to propagate the gospel is through blogging and social media. I started my blog Lifestyleofpeace.com about three years ago. Since then I’ve written about 500 articles on all sorts of Christian topics. My blog has been viewed over 330,000 times by people in 75 different countries. I love writing and sharing my thoughts in this way. In addition, I share the gospel via social media through scriptures, quotations, pictures, video sermons, and links to articles. It is a powerful way to reach the young who are so media savvy and technology driven. In addition, I regularly shared the gospel, gave out tracts, prayed with people, and handed out Bibles at the Salvation Army TLC in Wausau, WI. I’ve tried to continue to do the same at the Escanaba, MI corps, but it seems like while here God has been working on me personally. It’s been less about ministering and more about learning and working hard. And I’m OK with that. But I’m looking forward to getting back to sharing the gospel 24/7. I’m an evangelist at heart. Whenever I read a powerful scripture or think about Jesus Christ, my immediate and constant reaction is: People need to hear about this! That will be my constant focus as an officer, sharing the gospel and building the church congregation. There is a great need for pastors in our world today. Many church movements are lacking the leaders necessary to move forward in strength. This is true for the Salvation Army as well, especially in the midwest. There is a need for officers. But that doesn't mean just anyone is up to the job. Work as a Salvation Army officer is hard, very hard. It means long hours and difficult circumstances at times. It's also a blessing beyond measure to carry the gospel and meet needs in the name of Christ under such a banner. The rewards of the joy and peace found in serving the Lord are matchless. There is no life of greater importance, value, and authenticity than full service to God. It is a great challenge, it certainly is. I think about that often. But I'm reminded of the meaninglessness of my life before Jesus. I'm reminded how everything seemed pointless, meaningless, a bore and a drudgery. When considering that, to work and serve in the name of Christ makes the most sense of all possibilities in the world. What could be of greater importance than to serve and carry the gospel to the lost, wayward peoples of the entire world whose very souls hang in the balance? The clock is ticking. Make your life matter, make it worth something. You won't receive worldly fame or glory, but you'll receive the crown of glory in heaven, and much praise and glory in the next life. That is the goal. 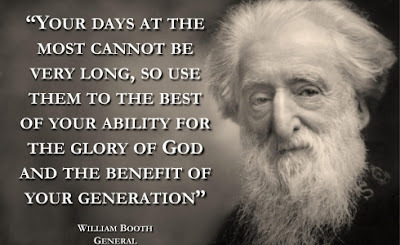 Officership in the Salvation Army though is not a job, it's a calling. This means that we don't choose it, it chooses us. Is God calling you to officership? Find out through prayer and the study of His word. Ultimately it's a calling. But if your reading these words, maybe, just maybe you are called as well. God bless. Politics & God: Should Christians be involved in Politics? Authoritarianism toward Christians in the name of "Gay Rights"